“Pain, self-reproach, anger, curiosity…”: scholarly reactions to being horribly, publicly duped. A group of book scholars evaluate the forgery that fooled them all. Citing Palmyra and Timbuktu, Ban Ki Moon called on the international community to do more to prevent looting and destruction. A rundown of some of the Art reveals from the Mossack Fonseca hack. The meeting will include information and strategy sharing as well as discuss training. Marine archaeologist Rob Rondeau calls on Canada to develop a more effective strategy to protect sensitive wrecks. The complicated story of a Colombian crown which is in the MET and not in Colombia. The Judaculla petroglyph rock in north Carolina was vandalized and images of the vandal have been released. The Portland porcupine, part of Glimpse by Wendy Klemperer, was stolen sometime in March or April. The South Dakota man raided a State bank account to buy Egyptian artefacts. A murky look at dealers, collectors, and museum donations. Siyuan Zhao pleaded guilty to attempted murder but has been deported to China; she was hearing voiced and has a history of severe mental health issues. 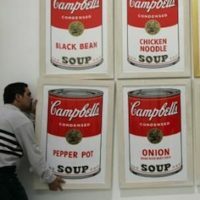 Seven of the ten Warhol soup cans were taken; the reward is for info leading to the recovery of the artworks. Not quite the resale of the Warhols but a nice though from artist Lindsey Wohlman. Portrait of a man by Bartholomeus van der Heist was pulled from the April im Kinsky sale as it was sized during the Nazi invasion of France. “Interior minister says art and antiquities crime is `not considered a priority'”. The paintings were stolen from Church of St Peter and St Paul in Kiltullagh, County Galway in June 2013. The pieces by Castellani were taken from the Villa Giulia museum. The Officers were actually looking for arms during a house raid near Enna when the antiquities were found. More on the Modigliani in Geneva and owned by and not by the Nahmads. The small piece by Ann Gascoine was taken from the Cambridge Drawing Society Exhibition. The piece was taken in a house raid and the ALR spotted it for sale at a regional auction house. These are some of the paintings stolen from the Westfries Museum in Hoorn. New evidence that three Brett Whiteley paintings were faked by conservator Mohame Aman. Yao Yuzhong has been sentenced to death with a two year reprieve. Three others received life sentences. This is not the solution to the problem. The theft occurred at Sri Mahadevi Nandikeshwara Temple at Malyady in Thekkattee village of Kundapur taluk. Various pieces from the Beyond Frames public art fest in Chennai were stolen or vandalized. A silver idol and other items were taken. A complaint about the missing coins has been lodged with Ambazari police station. The police said they needed a concrete base to file the complaint on and suggested Nagpur Uni conduct a department enquiry first. The panel to investigate the theft of the Vakataka era coins from Nagpur University is being put together. The statue was taken from a Buddhist temple but was it illegally brought to Japan? An article with dubious figures about the Turkish border town, which is a known smuggling route. Rampant theft of independent artists’ and designers’ illusrations in the online pint industry. …for a violent citizens arrest against the fella who was previously accused of extortion over a stolen Leonardo Da Vinci. A review of a new TV show “Sports Detectives”. One of four stolen in 1955, the stamp turned up at an New York auction house.